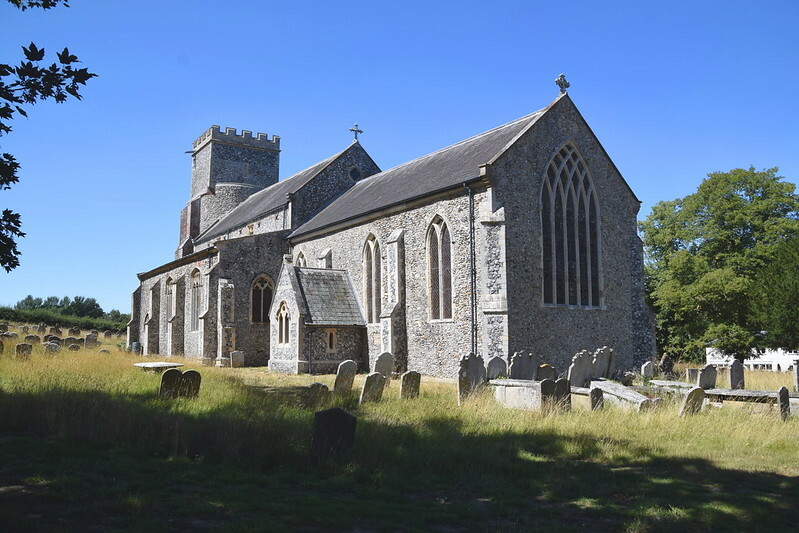 Norfolk is so huge that it swallows big churches like St Mary. Unless you knew to look for it, you would not even notice that it was there. Here, on a low ridge in a folding landscape, is one of the county's more interesting churches. And yet it does not even front on to a public road. You come down the narrow lane from Alburgh and across the old pack bridge, and there it is on the high ground above you. 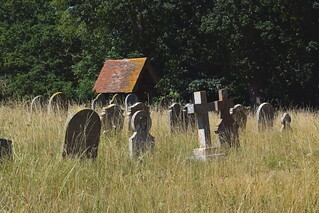 But to get to it, you carry on, and then through the yard of the Hall. 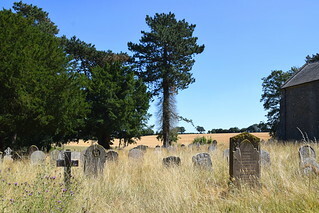 Beyond the converted stable block the lane opens up, and steps lead up into the walled graveyard. 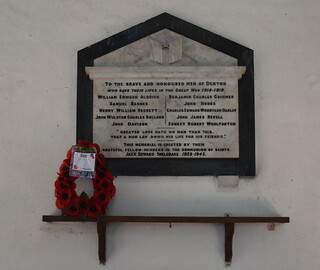 A sign reminds you that the building is now in the joint stewardship of the Church of England parish and the local United Reformed Church community. Denton has one of the most curious church towers I know, with evidence of three rebuildings, all of them quite different to each other. 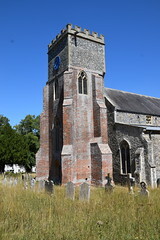 The earliest was a flint round tower, and the curved eastern face of this survives, abutting the nave. This round tower fell in the 18th century, and it was rebuilt in the late Tudor style, a beautiful red-brick square tower. Finally, the Victorians added the unusual west windows in the Decorated style, and a top stage was added in flint and freestone. There's nothing else quite like it. Across the valley to the west, the tall, stern tower of Alburgh stands, a sentinel. 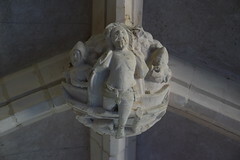 St Mary has a number of features that would be famous in almost any other county, and the first of these is the extraordinarily good series of bosses in the fine 15th century north porch. They are obviously by the same workshop as those at Hethersett and Wymondham. They are intricately carved, at once delicate and bold. 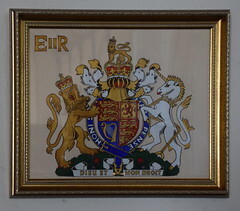 They have been sympathetically restored, and depict the Annunciation, the Nativity, the Resurrection, the Ascension of Christ and the Coronation of the Queen of Heaven. 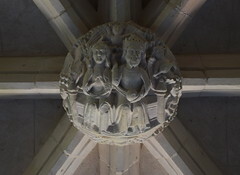 This is effectively a rosary sequence, and it is easy to imagine 15th century Dentonians standing in this porch telling their beads as they looked up in wonder. You step inside to what at first seems a large, anonymous, Victorianised interior. It was difficult for the Victorians to resist giving such a big church as this an urban feel, but there are still local, rustic survivals that provide a link with the lost generations. The most famous of these is the Denton chest, a large, solid object made up of panels painted with Saints. 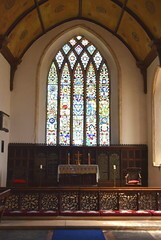 The panels are very small, and there is some debate about whether they came from a rood screen, a rood loft, or something else altogether; but in fact they are no narrower than the panels of the screen at neighbouring Alburgh. 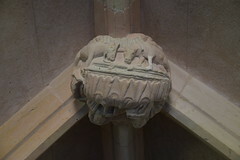 The chest is probably a 19th century construction. 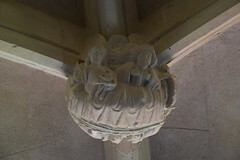 It features two Saints on each end, with two groups of four Saints on the front - twelve altogether. 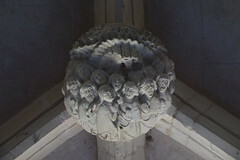 This is barely sufficient to stretch across the chancel arch here even if set in divisions, and with a doorway in the middle, but the odd mix of Saints suggests that some are missing. 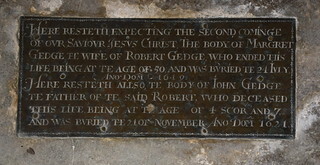 I'd have liked to have moved the chest to see if there are any others on the back, but for security reasons it is bolted firmly to the stone floor. Anyway, on the east end of the chest are St Agnes, with a dagger and a little lamb, and St Dorothy, with a basket of flowers. 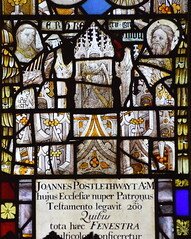 The eastern range on the front consists of St Jude with a boat, St Peter with a bunch of keys, a Bishop who appears to be wearing a papal tiara and is therefore St Gregory, and St Clement with an anchor. 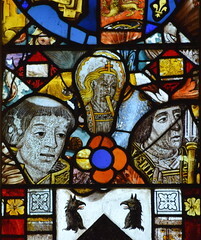 The western range on the front is St Zita with her household keys, St Barbara with a tower, St Edmund in royal robes and carrying an arrow, and St Edward the Confessor in royal robes carrying a ring. The west end of the chest contains probably the most interesting figure, St Walstan of Bawburgh with his scythe, and St Paul with a sword. Perhaps the most spectacular feature of St Mary is the east window. 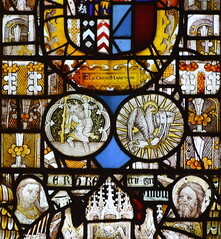 This is an elegant four light window, with interlocking tracery, and it is crammed full of English and continental glass, mostly from the 16th and 17th centuries, but with a small amount of very good English medieval glass set in it. 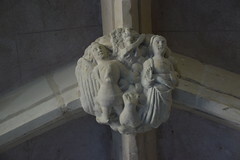 Two roundels in the centre, depict St Christopher and the eagle of St John. 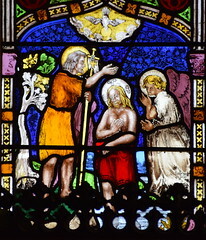 Just above, the Flemish glass is signed C Le Grys Manfylde, 1567. 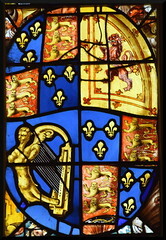 There are at least two sets of Royal Arms, one fragmentary, but the Stuart set is complete and particularly vivid, and some of this glass probably came from secular buildings originally. 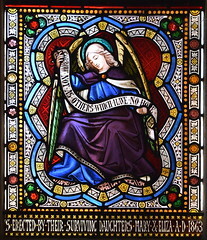 Windows of this kind are not unusual in Norfolk, and are of two kinds. 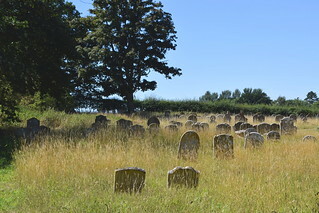 Either, as here, the collection of some antiquarian local Squire or Rector that was bequeathed to the church, or sometimes a collection bought as a job lot, often from the Norwich dealer JC Hamp. 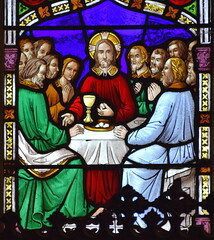 A small pane records that the glass here was collected by the Rector, John Postlethwaite, and it was left to the church along with an astonishingly large amount of money, £200, to have it installed. This is about £40,000 in today's money. No wonder they did a good job. 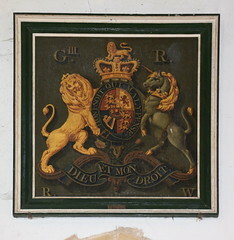 The most interesting thing is quite how early this was, for while many of the collections of this kind made their way into churches in the late 18th and early 19th century, but this dates from 1716. It was reset by Ward & Nixon in the 1850s. There is a grand piscina and a single seat of the former sedilia up in the chancel, which must date from its early 14th century construction. 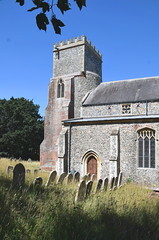 At the other end of the church, the entrance to the stairway that leads to the parvise, the upper storey of the porch, is in the north-west corner of the nave. 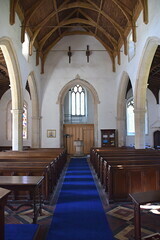 It is a grand entrance with a fleuroned doorway set under a triangular pitched roof. This upper storey was obviously open to the elements for many years. 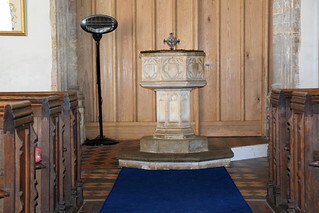 The font, with its shields in quatrefoils, is set in a sea of minton tiles, but at least the Victorians didn't replace it. 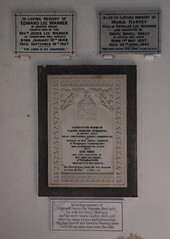 There seems to have been a particular loyalist sympathy in this parish over the centuries. 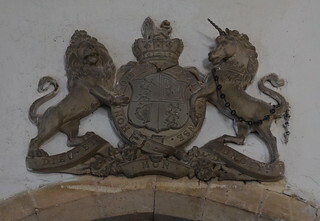 There are sets of royal arms to both Victoria (in stone) and George III (on boards) at the back of the church, set above the south and north doors, and on the west wall a set for the current queen. 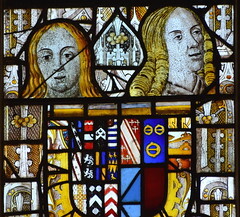 Along with the Stuart set in the east window, this means the church has four complete sets of royal arms, more than any other church in East Anglia.